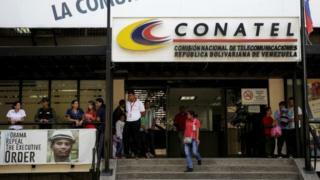 Venezuela's communications regulator Conatel has taken two Colombian television channels off the air. Caracol and RCN were pulled overnight in a move that the channels called "censorship". Earlier this year, CNN's Spanish language channel was also stopped from broadcasting in Venezuela. Commenting on the move, RCN said that "the regime of Nicolás Maduro continues its crusade of censorship against Colombian media". Ms Ortega, who until recently was Venezuela's chief prosecutor, has become one of the most outspoken critics of the Maduro government. Once a firm government ally, she denounced attempts to strip the Venezuelan legislature of its powers. She also said that the creation of the constitutional assembly was unconstitutional, only to be removed from her post by that very assembly in one of its first actions. After her husband was accused of extortion, the couple fled to Colombia on 18 April, where they were offered asylum by President Juan Manuel Santos. Ms Ortega and her husband have since travelled to Brazil, where she spoke at a crime-fighting conference in Brasilia. There, she accused President Maduro and senior officials in his government of corruption, which they have denied. President Maduro said he would ask Interpol to arrest to couple. The twists and turns of the story were closely followed by Caracol TV and RCN. President Maduro has been highly critical of international media organisations. In a press conference on Tuesday, he said that the BBC "has become the biggest propaganda apparatus for the military intervention" in Venezuela. He also said that it was "hard to neutralise the lying power of CNN, Fox News and the BBC". "They are sowing hate every day," he said. After it was taken off the airwaves, Caracol TV said that it regretted the decision taken by the Venezuelan government. "Noticias Caracol has always carried out its journalistic work in an objective and truthful manner and following principles that we consider fundamental: to offer journalism with context and listening to all points of view," the channel's statement said.